Do you have any "black holes" in your home -- places where things go in but don't come out? For some it might be a hall closet or backyard storage shed. For me it's my freezer. I grocery-shop, and things I'm not going to use immediately I stash in the freezer. Much goes in but little comes out. I seem to cook with recently purchased food and forget about my frozen stash. My side-by-side freezer is always so stuffed that it's a chore to get any new items inside. Last week, I bought some frozen butterfish. Since I wasn't going to cook it until later in the week, into the freezer it went. Thankfully, the fish packages were thin and could slide in easily. They took up the last few free cubic inches. It's especially challenging when I shop for house guests and have to stuff even more food in the already full freezer. That's when a major purging takes place. To make space, I end up dumping the old food -- sometimes quite a lot. I wondered if I was the only one with this wasteful habit, so I asked around and found that this "freeze it, forget it, dump it" process is all too common. It's a form of "freezer bulimia" that we seem to practice. Of those I queried about their freezer habits, my brother-in-law and his wife were the only ones who seem to be responsible freezers. They have two refrigerator/freezers and like to cook extra to freeze. They label and date, keep a list and are careful to use what they have. They try not to buy too much or store too much. If I asked you, could you tell me what you have stored in your freezer? Although I had a general idea, it sure wasn't clear enough to be useful in my menu planning. "Shop" in your freezer to use items you've stored. Keep a running list of what's there and plan your weekly meals accordingly. Intent on stopping this wasteful habit, last weekend, I took an inventory. I set up a card table next to my freezer and emptied out the contents shelf by shelf. What did I find? Some surprises -- a bag full of luscious lychees that I had saved for the children when they came home for Christmas. It's too bad I had forgotten about it as they really would have enjoyed it! Also, half of an ice cream birthday cake of unknown vintage -- stale. That got tossed. And butterfish that I already had, along with mahimahi and four packages of salmon. And frozen whole taro -- now, what was I going to use that for? What was my freezer full of? Lots of good intentions. I made a list of the contents and will plan menus to use up what I have. This month, I'll grocery-shop in my freezer! If you want to put an end to freezer bulimia, I encourage you to clean out your freezer and list what you have, posting the list where you can see it and refer to it often. This month, use what you already have. Think of the money you can save! And from now on, be careful of what you buy -- buy only what you need and will use. Resist the urge to buy in bulk just because it's cheaper. It's not really a bargain if you end up throwing half of it away. Part of being organized is being in control of what we have. 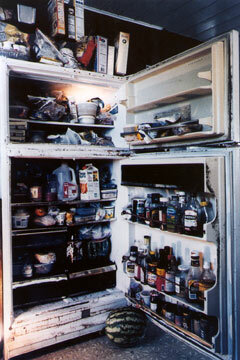 Let's not let our freezers be black holes that swallow up perfectly good food bought with our hard-earned money!